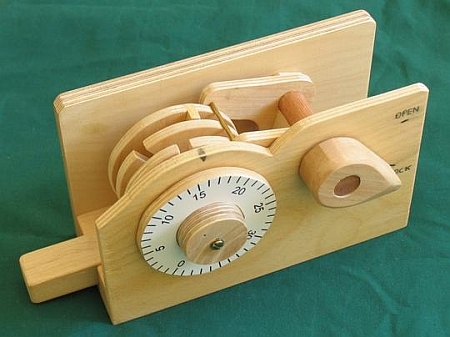 Intended as a demonstration of combination lock principles, the Wooden Combination Lock from Matthias Wandel is also fun piece of woodworking. A post on the Make blog has a YouTube video of the lock’s operation (which includes a short clip near the end about a Master combination lock vulnerability). Matthias has more details and photos on his web site. You can get detailed plans (which include a SketchUp model) from him for $7 . The above two pictures show the tabbed rotors and unlocking slot. An additional video on the web site illustrates how to work out a left-right-left combination for these locks that’s different than the usual right-left-right combination. I’ve seen him snubbed by woodworking magazine editors because he “makes jigs and little else”. I think they’re evaluating him all wrong. He’s more of a part-time Edison who favors the realm of wood. If he’s a geek, then he’s my kind of geek. SWMBO doesn’t much care for the quality/style of furniture I can crank out (much less watching the calendar click by as I proceed with glacial speed)and I get a lot of pleasure trying to figure out how to get things done on my shopsmith. This guy seems to enjoy experimenting and sharing. I bought his plans for his home-made slot mortising machine. That thing is wicked cool. Lee Valley sold books on how to make various wooden pad locks. The one I have is by Tom Detweiler and has plans for a similar combo lock, although the pictures are inferior to Matthias’ and the instructions are ok but not great. Matt, how do you know he has been snubbed? I can definitely see Fine Woodworking snubbing him unless the pieces were all French polished in some laborious fashion. Can it be made for a O level product? Not recommended, can easily fail you if not done properly.